Several options in the Share and Create panels require that you use Adobe Premiere Elements. The items denoted as Burn Video DVD/BluRay, Online Video Sharing, and Mobile Phones and Players all require Adobe Premiere Elements. If any of these items interest you, you can download a free trial of Adobe Premiere Elements and work with it for 30 days. If Premiere Elements is a tool you find worthwhile, you can purchase it from the Adobe Store. If you’re perusing this book and have not yet purchased Elements 13, you can purchase the Adobe Photoshop Elements 13 and Adobe Premiere Elements 13 bundle. Buying the bundle purchase is much less expensive than buying the products separately. For Adobe Premiere Elements trial versions, just click one of the options for video sharing in the Share panel, and you’re prompted to download a trial version of Premiere Elements. You have a variety of options for sharing photos and placing orders on a number of service networks. The more popular services (Flickr, Facebook, and Twitter) are used here as an example for connecting with a service provider. If other services interest you, poke around and explore options for the services you use. Previous users of Elements will immediately notice that services such as Flickr, Facebook, and SmugMug have been promoted from options nested in the More Options drop-down list found in earlier versions of Elements to buttons shown in the Share panel. Whether you’re uploading photos to Flickr, Facebook, or Twitter, you follow the same process in Elements. You first select photos, albums, or creations in the Organizer and then click the Flickr, Facebook, or Twitter button in the Share panel. You need to authorize Elements to communicate with these social networks before uploading any content. Click the Authorize button and proceed to a login page, where you supply your account username and password information. After you are logged in to a site, the process for uploading images is easy, where we logged in to Facebook. If you want to add more photos, click the plus (+) button. Selecting a thumbnail in the window and clicking the minus (–) button deletes the photo. 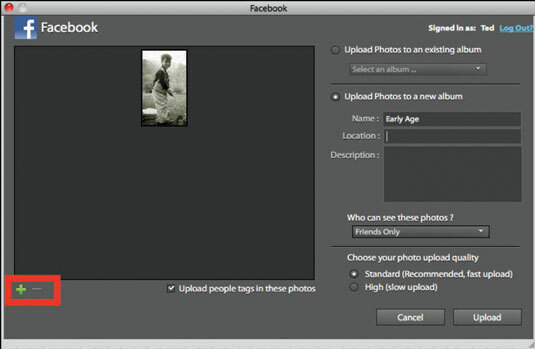 You can choose to add photos to existing Facebook albums or create a new album by selecting the respective radio button choice. You have privacy options. For Facebook, open the Who Can See These Photos? drop-down list and choose who can see your photos. In Flickr, you have choices for Private and Public. Within the Private option, you have choices for visibility to Friends or Family. 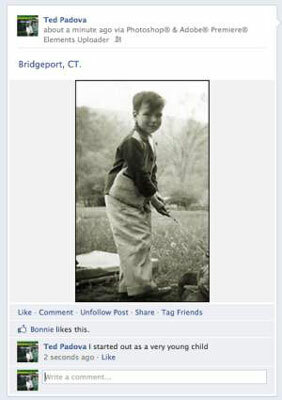 After a photo is uploaded, you see the photo on your timeline or in a photo collection. After you become familiar with uploading photos to a service, you can easily follow similar steps to upload photos to any of the services that are supported by Elements. You first encounter the window to authorize an account. When setting up a new account, you can log in to the service and create the new account. When you enter a site for sharing photos, printing photos, or creating items such as photo frames, follow the easy online steps that each service provides.